What does it means to be making art through social engagement right now? Artists, activists, community groups, curators, students, academics, funders and sectors working in the social realm are invited to join the conversation through a series of events at Site Gallery and other venues around the city. Through building a network, showcasing practice and expanding dialogue, the Summit will develop agency in the field of art and social practice and test the ground for launching a Social Art Biennale in 2020. Ten years of severe austerity measures together with the wider divisive political climate has triggered a sense of urgency for conversations around the impact on communities. We are interested in questioning, what kind of society do we want to live in and what roles can artists play? The programme includes a series of artist-led labs; presentations by international guests; workshops; discussions; film screenings; a publication launch; free lunch each day; a party on the Thursday night; plenty of opportunities to network and share practice, and a whole host of diverse work presented by artists and practitioners. Artists leading labs include Harold Offeh, Anna Francis, Sophie Hope, Elsa James, a place of their own, Sophie Hope, Rebecca Beinart, Sally Labern [Drawing Shed] and Studio Polpo. International guests include Black Quantum Futurism & Interference Archive. In 2016 artist and filmmaker Eelyn Lee was selected by Artquest to convene a group of artists with socially engaged practices to form a Peer Forum at Peckham Platform. 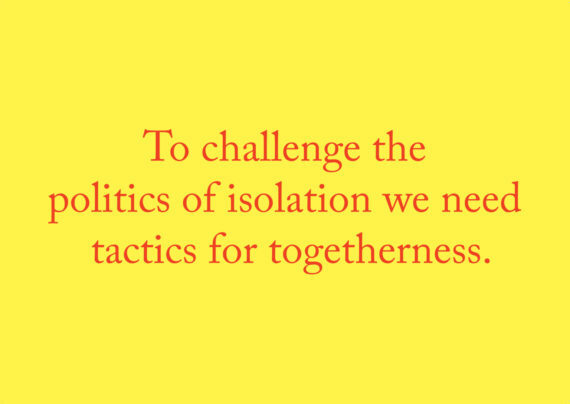 These sessions, with twelve artists, triggered urgent conversations around the need to de-marginalise the practice, leading to the idea for the Social Art Summit. In 2017 Eelyn and fellow peer forum artist R.M. Sánchez-Camus [Marcelo] co-founded Social Art Network (SAN), a base from which to realize these ideas. Eelyn and Marcelo are working collaboratively to co-convene the Social Art Summit; build an artist-led network; expand dialogue and develop the first ever Social Art Biennale. SAN aims to build agency for artists and communities making art through social engagement whilst developing new audiences for the work both nationally and internationally. Sheffield based artist Ian Nesbitt is this year’s guest co-convener of the Social Art Summit. Social Art Network has been developed through the volunteer labour of artists interested in social practice. ABOUT THE ARTIST ​ Marcelo is a creative practitioner who develops works of art in collaboration with community partners. He creates site-responsive works that activate dialogue, interaction, visual impact and community cohesion. His interests lay in neighbourhood narratives, hidden mythologies, psychogeography, and outdoor works. ​ He is a London-based creative practitioner born in New York City to parents who emigrated from Chile. His work explores interaction, public spectacles, social systems, the body politic and urban imagination. His practice can be understood in four layers that mutually compliment and inform each other: collaborative making, psychogeographic explorations, visual arts and social art. Marcelo’s commitment to social engagement and site-specific work has led him to design and deliver a range of works such as parades, street banners, outdoor performances, sound installations, audio walks, circus, and immersive theatre. He was co-founder and Artistic Director of LOTOS Collective. from 2006 to 2012. He earned a Bachelor’s in Fine Arts in 1999 from the School of Visual Arts, NYC and in 2006 was awarded a Master’s in Scenography from Central Saint Martins College of Art & Design in London. He was successfully awarded a PhD in Performing Arts at Brunel University entitled: 'Applied Live Art: co-authorship in socially engaged and site-responsive performance practice', which was subsequently published as a book.